Fausto Carmona pitched for us today against Akron in an exhibition game created pretty much just for him, so he could stay on schedule to pitch in the 5th game of the Indians’ schedule. He basically dominated, allowing only one hit in (I think) 7 innings. That one hit was a solo home run, but otherwise he was dominant. Hopefully that keeps up for the Indians this year. Tomorrow is my last warmup for the regular season. I’ll be throwing a 4-inning simulation in the bullpen to get the necessary work and progressively prepare my body to pitch for 5 innings on April 10th. For now, I’m going to watch part II of the National Championships as Tennessee (wo)manhandles Rutgers. 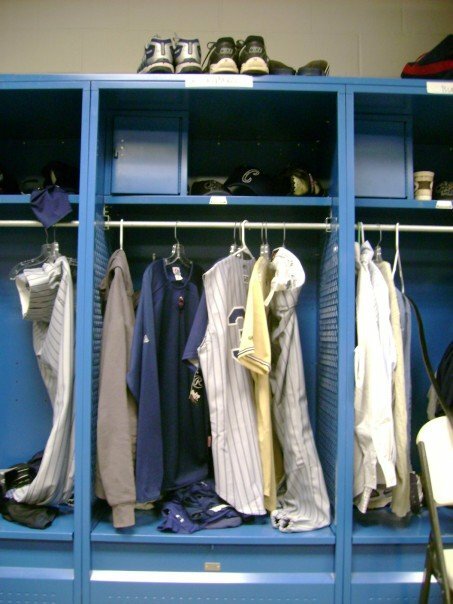 P.S.- I gave you an inside look at my spring training locker a few posts ago. well, here is an actual look at my Lake County locker. Everything’s there, plus a bunch of pitching or baseball-related books. Mike, keep up the great work. Love the blog. If you get a chance, e-mail me back. Would like to do an article on you for our site (www.theclevelandfan.com)which is partnered with the Indians cable network Sportstime Ohio. We provide on-line content for the Indians. Excellent update. What a treat to watch Carmona throw! BTW your locker looks really organized. Does that change as the season progresses? We are still recovering from the Hoya’s loss. Lora traveled to Atlanta to meet up with her buddies from G’town and watch them lose to OSU. Hibbert had a remarkable game, but Green, Summers and Ewing never quite got on track…But the good news is that they have two phenom freshman…and the basketball program under JT III is definitely back! I still remember meeting up with you and your folks at the games. Who knew then that you’d be living your dream. Congratulations and have a great season!